↑ Weingroff, Richard F. (Summer 1996). 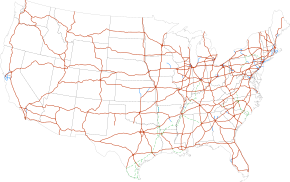 "Federal-Aid Highway Act of 1956, Creating the Interstate System". Public Roads. Washington, DC: Federal Highway Administration. 60 (1). ISSN 0033-3735. สืบค้นเมื่อ March 16, 2012. ↑ Office of Highway Policy Information (October 21, 2014). ﻿Table HM-20: Public Road Length, 2013, Miles By Functional System﻿ (รายงาน). Federal Highway Administration. http://www.fhwa.dot.gov/policyinformation/statistics/2013/hm20.cfm. เรียกข้อมูลเมื่อ April 3, 2015. หน้านี้แก้ไขล่าสุดเมื่อวันที่ 12 เมษายน 2561 เวลา 21:44 น.